As more and more women's are becoming Fashion conscious,more and more model in the blouses are coming up nowadays in blouses full sleeve are most popular .As the weather gets colder, Bollywood opts for ways to keep warm. What better way than to cover up those arms with some sleeves! from Bollywood to all south Indian actresses also wearing and inspiring us. 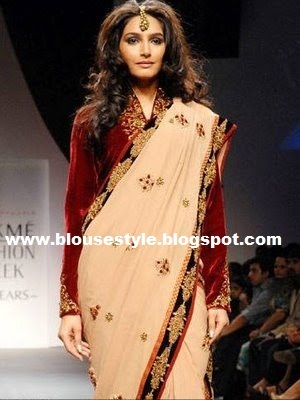 Women's Embroidery full sleeve blouse with velvet cloth and black border Georgette saree..
Actually it's old fashion .. but lot of re embellishments and variations are there... These type of blouses are feminine and can make you look soft, elegant,or both. here are some of Bollywood's scarlet's donning this trend.